A modern retro collection should have a good batch of games and some extra niceties like save states and emulator settings. SEGA Genesis Classics checks those boxes, providing the best way to do what Nintendon't today. But considering it doesn't even have all the first-party hits that it should, much less the most memorable third-party ones, it's hardly a definitive package. There's a disappointing lack of museum features, but you can't really argue with 50 classic Mega Drive games, online play, and a surprisingly generous price tag. Unless you own an impressive collection of 16 bit cartridges and an old TV, this is the best way to play Sega classic games. We miss some titles (specially racers, shooters and third party) and more extras, but still a great compilation for old school gamers. Lots of good/great games in a competent package. But... where are the third parties classics? A great compilation with a lot of classics but we miss some games and a few more extras in the mix. Many of the games featured were great back in the day, but if we're going to revisit them now, it'd be nice to have some more features for the nostalgic amongst us to enjoy. 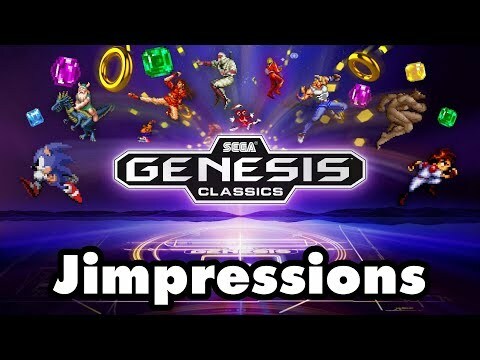 Sega Genesis Classics boasts an amazing collection of 50 games, all of which will keep you busy and entertained for hours. Some of the games can be challenging to a fault, but that's just the way some old school games were made. The games hold true to their original forms and bring you a cartridge full of nostalgia that you can pop right into the console of your heart. Sega Megadrive Classics is certainly not ''the'' ultimate collection which will satisfy everyone, due to the lack of some great games and the retirement of others, but the new entries are also remarkable. The offer is still efficient as before. We regret that too few games can be played in french language. Still, for the price, that collection worth its purchase, either to discover some forgotten gems ( and some rotten games too), or to initiate those who have not known the90's in video games with a best-of coming from one of the best consoles of its generation. All in all, this collection is fine. I can't criticize the game selection based on what it's not. It's just tiring having yet another incomplete look at SEGA's games for their most popular system ever. Despite the lack of some great titles and a technically forgettable multiplayer, SEGA Mega Drive Classics is a good collection that offers dozens of hours in old-style fun. While I continue to lament the lack of certain exceptional titles, the wide range of games being offered helps ease that pain. If you're looking to dive back into the Sega library without hauling out old hardware, the Sega Genesis Classics collection is a fine choice. SEGA Mega Drive Classics is a very generous package, offering over 50 16-bit titles for a very reasonable price. This collection of titles from a golden age of Sega has some of the greatest 16-bit games ever made included, and also features a few important, if dated, gems. The extra challenges and nifty menu screen are pleasing additions, but thanks to minor latency issues and the existence of multiple Sega game collections over the years, this is only really recommended for the sake of convenience and/or curiosity. The emulation is perfect, the extra features are great and the Switch is the perfect system for this bit of nostalgia. Unfortunately, the collection of games is a little lacklustre, with the real standouts games that we've seen bundled together many times before. SEGA's had more than one stab at creating a comprehensive collection of its best Mega Drive titles and, as a result, SEGA Mega Drive Classics does lose some of its impact due to sheer familiarity; for example, we already have an immaculately-ported version of Sonic on the Switch eShop right now. Even so, it's hard to argue with the 50-odd games that ship with this new compendium, and only a fool would contest the fact that it showcases some of the best games of the 16-bit era. The modern-day enhancements are welcome too, and while this isn't the first time many of these games have gone portable (SEGA Mega Drive Collection on the Sony PSP did that over a decade ago, and let's not forget the amazing SEGA 3D Classics range on 3DS, which overlaps with some entries in this selection), it's a real boon to be able to play the likes of Phantasy Star IV or Story of Thor on the bus. When you take into account how much quality there is on offer here, SEGA Mega Drive Classics becomes an easy recommendation. For 29.99€ you'll bring yourself home more than fifty titles that changed the gaming history in the early 90s: SEGA Mega Drive Classics is definitely a reasonable package, one that's pretty well built considering the variety of the selection and the online support. Not everything has aged properly, but it's still well worth it (especially at this price and during this seemingly never-ending wave of nostalgia). This collection of classic Sega Genesis games features a wide array of great titles at an unbeatable price. Just make sure you have a passion for retro games -- or feel hopelessly nostalgic for the 16-bit era. At the end of the day, Sega Genesis Classics is simply a collection of 50 games from 25 years ago that will inspire brief moments of nostalgia. It's not the first collection of Sega games to release, and I'd be hard pressed to say it will be the last. Sega Genesis Classics is without a doubt the best hommage the old 16-bit Sega console could receive. With 50 games, which features solid gold trilogies, only the retrogaming haters may miss this very best-of, lacking the expired licence-based titles. The new interface offers countless options to prevent us from frustration, and the four saves slots for each game could take you back to the past for more than a few hours.